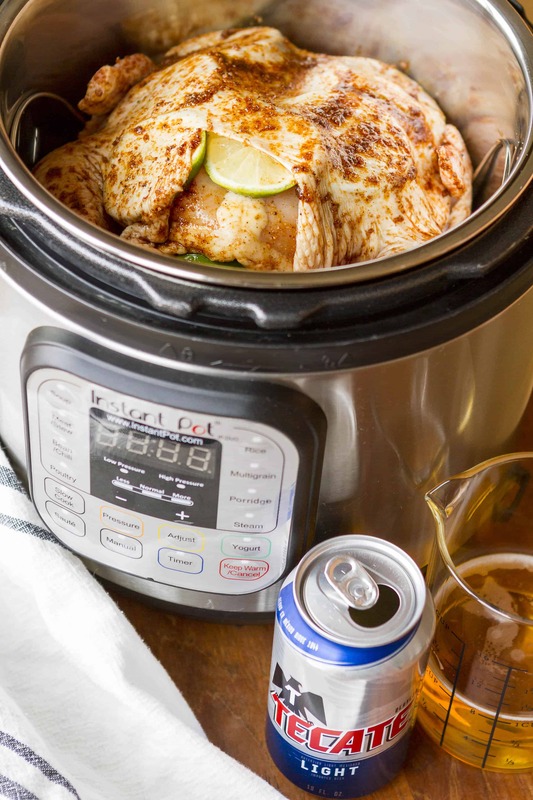 This pressure cooker beer can chicken recipe is sure to be the hit of your next tailgate party… A tender pressure-cooked whole chicken infused with light beer and fresh limes, smothered in an amazing beer-infused gravy = a winning combination! Is there anything you can’t make in an electric pressure cooker? Seriously! I’ve had this idea for making pressure cooker beer can chicken in my head for quite some time now, but I’ve not had time to really work out the logistics… You know, like is the beer can actually essential? Turns out, no, you only need the beer itself. And do I need any other special equipment? Again, no, the trivet that came with your cooker works perfectly. Will it still have all of the flavor of a beer can chicken made on your grill? Yes! 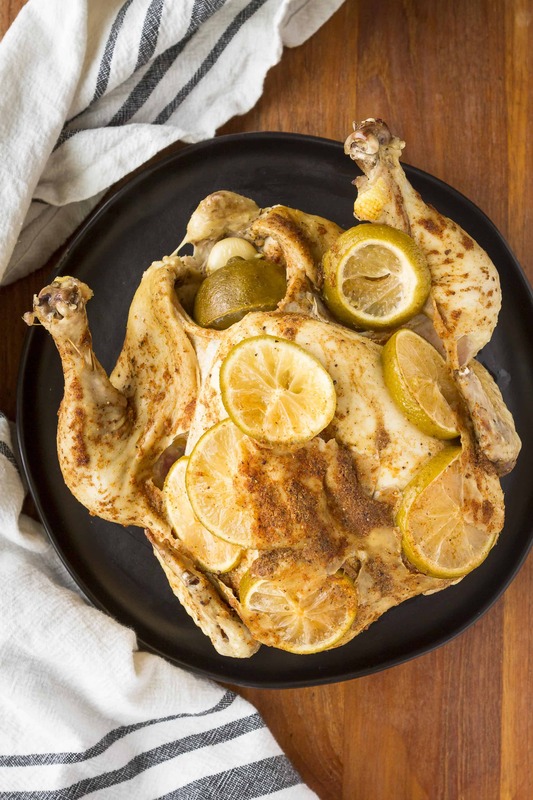 Of course, you won’t have the same crispy skin that you get when grilling beer can chicken… But you WILL have tender and flavorful beer-infused chicken in a fraction of the time — and you don’t have to freeze your behind off manning the grill during these cold winter months. PLUS you can make a to-die-for gravy with the drippings that MORE than makes up for it! 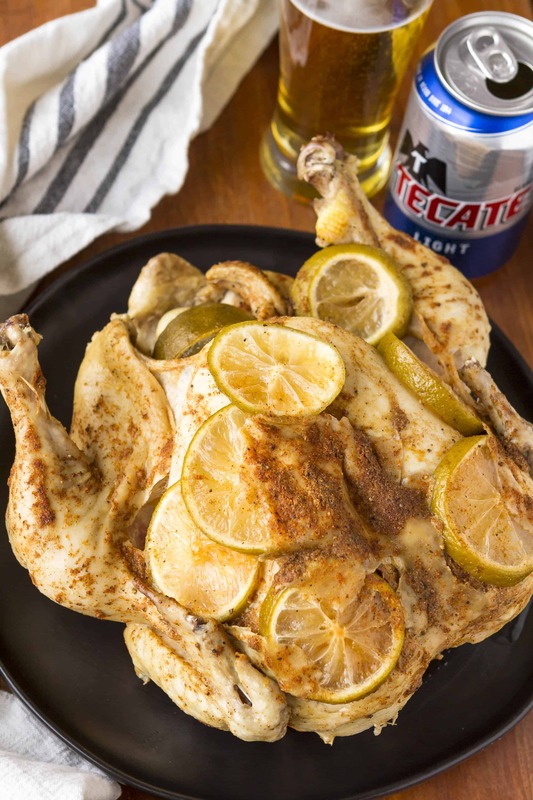 Let’s start with the beer in this beer can chicken… First off, you should always (always!) choose a beer that you enjoy drinking. I mean, if you don’t love the flavor of the beer to begin with, why on Earth would you want to cook with it?! I feel like a light beer yields the best flavor in this recipe, so I chose to use Tecate Light, a refreshing imported Mexican beer. Its bold flavor pairs well with a great meal, so it’s only natural that it would work equally as well infused IN a great meal! Tecate Light has a light citrus flavor and aroma, thanks to the fermenting process and the hops used to brew it. So adding more citrus in the form of fresh limes seemed like a no brainer. As did adding some chili powder, garlic and onions, which all pair well with limes. Sounds good, right? I also threw in a good measure of smoked paprika. If this spice is not already in your collection, pick some up ASAP! It’s my favorite “secret” ingredient for giving any meat that cooked-on-the-grill smoky profile without actually cooking it on the grill. Season the chicken inside and out with the spice mixture, making sure to loosen the skin and get plenty of it underneath. The goal is to really season the meat itself, since the skin will mostly be discarded. 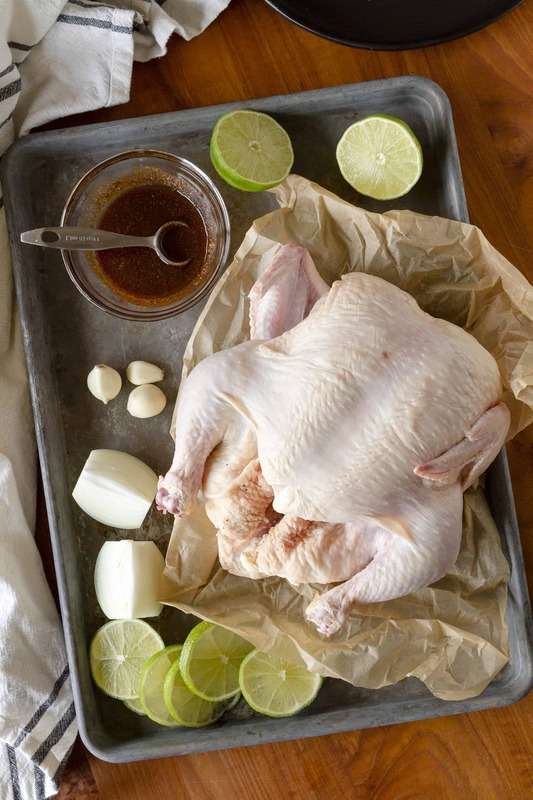 While you’re at it, slide some sliced limes underneath the skin, and we’ll add more cut limes, onions, and garlic cloves to the cavity of the chicken. We’ll skip searing the skin, since it’s not going to stay crispy anyhow, and just pour about one cup of Tecate Light into the bottom of the pot. Then we’ll set the prepared chicken on the trivet that was included with the cooker and close and lock the lid in place. Cook on Manual/High Pressure for 25 minutes, and then hit Cancel and let the pressure release naturally. 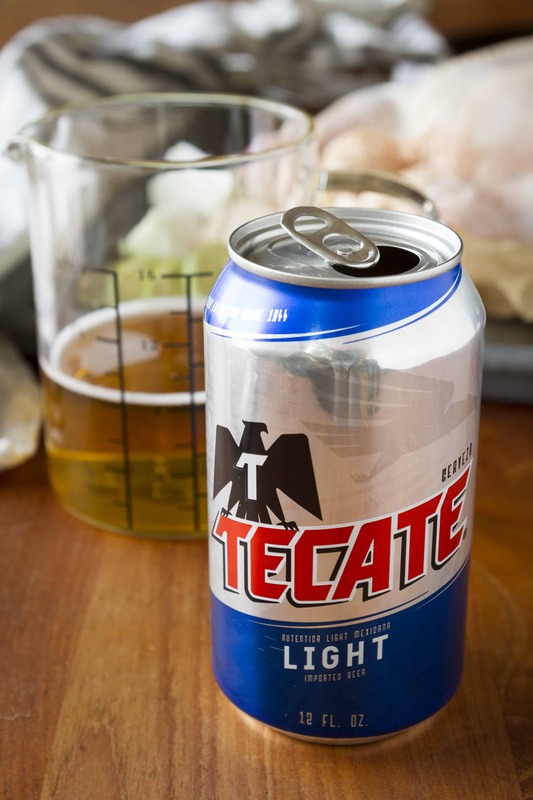 While your chicken is cooking, you can enjoy the remainder of your Tecate Light… Wouldn’t want it to go to waste, would we? Now about that gravy… Don’t skip this step — it’s SO good! 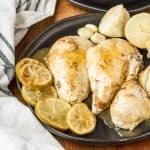 After removing the cooked chicken from your pressure cooker, press the Sauté button, and let the remaining juices and drippings come to a boil. Stir in a couple tablespoons of cornstarch mixed with cold water, and boil until you get a thick gravy. Ladle this over the sliced or shredded beer can chicken liberally. Chances are you’ll end up with waayyy more gravy than you need for one chicken. I highly recommend freezing it in a silicone ice cube mold for future gravy cravings! Prep the chicken by removing the giblets and neck (if included), as well as any plastic or twine used to tie it up. Pat the skin dry with a paper towel. Season the cavity of the chicken with kosher salt and pepper, as desired, and insert half of a lime, half of a medium onion, and the garlic cloves. In a small bowl, mix together the kosher salt, smoked paprika, garlic powder, chili powder, pepper, and olive oil. Rub this mixture all over the chicken, focusing on really working it under the skin on the breast side. Insert the additional lime slices under the skin on the breast side. Pour 1 cup of Tecate Light into the bottom of the pressure cooker pot. Set the trivet down in the beer, and then set the prepared chicken on the insert. Close the lid and lock it in place, making sure the pressure valve is set to Sealed. Press the Manual/High Pressure function, and set the time for 25 minutes. When the chicken is done cooking, hit Cancel and allow the pressure to release naturally. Once the pressure has released, you’ll be able to open the lid. Insert a meat thermometer into the thickest part of the chicken breast to ensure that it’s reached a temperature of 185 degrees. If it hasn’t, re-pressurize and cook for an additional 5 minutes, and then check it again. Remove the chicken to a platter to cool slightly, and then shred or slice. 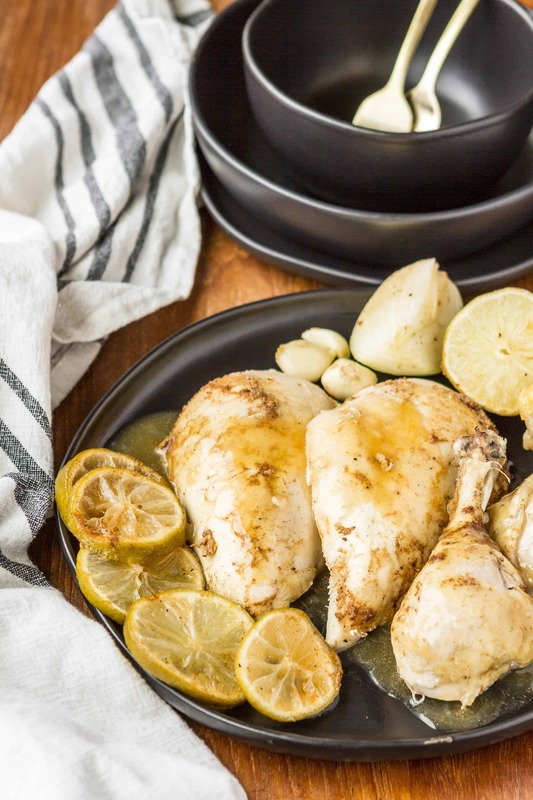 After removing the cooked chicken from the pressure cooker, press the Sauté function and allow the remaining juices and drippings to come to a boil. Stir in 2-3 tablespoons of cornstarch mixed with a little cold water and boil until you get a thick gravy. Use the Tecate beer locator map to discover where you can enjoy a cold Tecate Light near you. I’d love to see how your pressure cooker beer can chicken turns out… Tag me @Unsophisticook on Instagram and use the hashtags #TecateLight and #Unsophisticook so I can check it out. Enjoy!